To celebrate, the husband has two additional harnesses on order from Macomber to bring the total loom harness count to six! Silly me, I thought they had these things in inventory, I did not realize they were made to order and usually take six to eight weeks to ship. So, while I continue to wait for the loom upgrade, I decided to spoil myself a little. 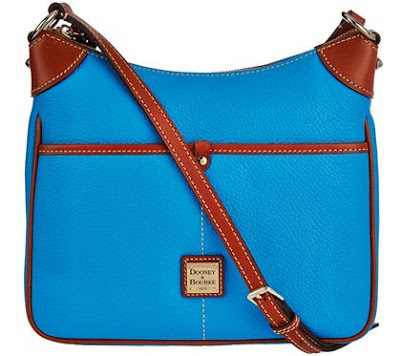 First off, I bought a cute little cross-body bag in a bright color. It was cheerful and fun. Fortunately, it is big enough to carry all my stuff and so easy to wear! Secondly, I tend to cycle through my obsessions over time. I will enter a reading phase and do nothing but read for several weeks. 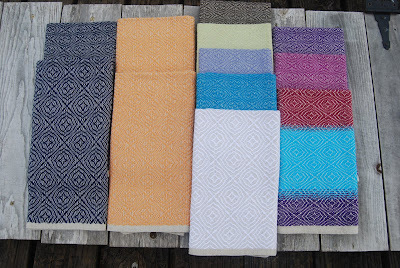 Then, I will transition into a knitting/needlepoint/cross-stitch/weaving chapter, which may last a year or two. Lastly and least often, I will hit an intense writing phase wherein I constantly have pen and paper in hand. I say intense, as I will wake up at one in the morning, get out of bed, and write until almost dawn. In the last few years, the knitting has carried over into the other activities, as I have been able to knit rather continuously. As the writing muse has been elusive for a very long while, I am not completely surprised to find the itch has begun to return. Normally, I am not temperamental about when and under what conditions I write. If the story is dynamic and pulsating, I could sit in the middle of Grand Central Station with a pencil and a stack of brown paper bags to write on with no problem; however, more often than not, it is the feel of a nice pen on thick, smooth paper, which carries the story along. I could absolutely type, but as a crap editor of my own work, transcribing from paper to computer forces me to edit, at least once. 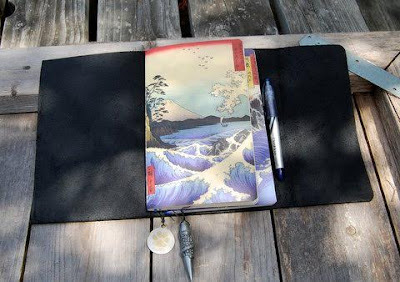 Thus, my birthday was a decent excuse to find a refillable journal to carry along with me. 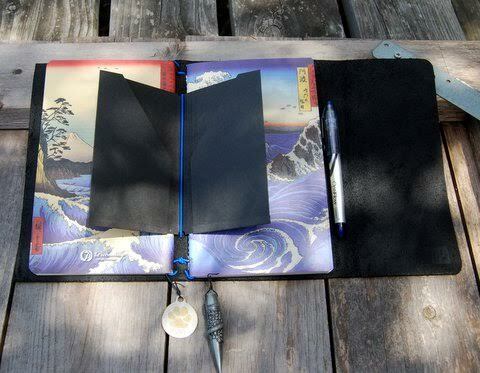 It is the Fillion Tri-fold from Little Mountain Bindery. 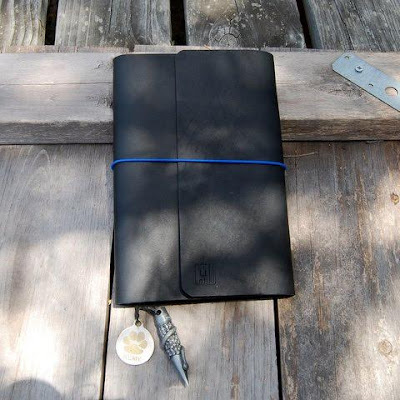 It uses Moleskine Cahier-sized journals, but it came equipped with similarly sized Piccadilly Pocket Memos from Barnes & Nobel (which are currently on sale at 3 for $2.99!!!!). After watching a tutorial video from Little Mountain Bindery, I have on order Patricia's Trifold Pocket with Magnetic Closure and a set of book connectors, not to mention a Moleskine weekly planner to slip in there, too. 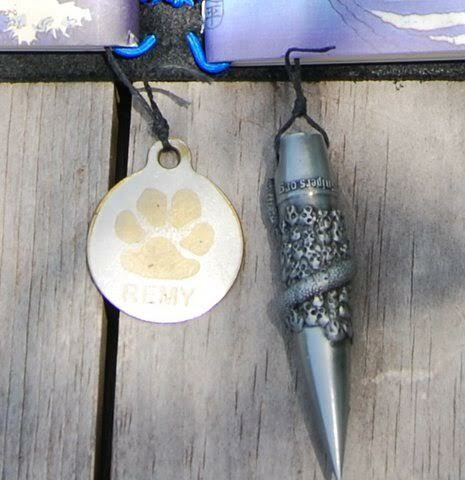 It came with two leather bookmarks to which I added a couple of charms. The one on the right was attached to a package from a dear, sweet friend of mine. The one on left is the tag from the dog collar I have hanging in my office. It belonged to my faithful Remy, the Standard Poodle I lost to lymphome on September 22 of last year. Even though we have a house full of delightful dogs, my heart still aches for my Remy. In fact, last night, Bane was causing a ruckus in the other room and without thinking, I called out "Remy," instead of "Bane." It kind of shocked me, but the heart and the mind are funny things. Initially, I had no idea how to attach them, but after a few failed attempts, I remembered how to tie on a fishing hook and used that method. Success! Off to use and enjoy the new journal purchase! Anyone care to share their indulgent "to me, for me, from me" purchases? Just lovely and you deserve the best! I haven't indulged in any "to me, for me, from me" instances in a while but I feel the urge coming! LOL We are having all the windows replaced tomorrow but that doesn't count! Miss reading your drafts. Are you continuing the story you were working on or starting a new one? Either way, can't wait. Miss you! Windows, my friend, do not count!! 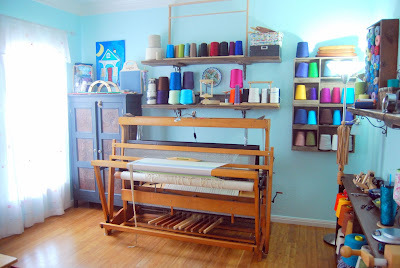 I have a couple of things that are in dire need of finishing, as well as several new things percolating.